Today was jam packed! We began with breakfast on our own which means the best of what you could find at 7/11. They told us before we left that 7/11 would become our bestfriend and I was reluctant to believe them but now I understand. It is the only “guaranteed safe” place to eat and has similar things to what we are used to. After breakfast it was into the vans for a 2 hour drive out to a very rural Thai village. 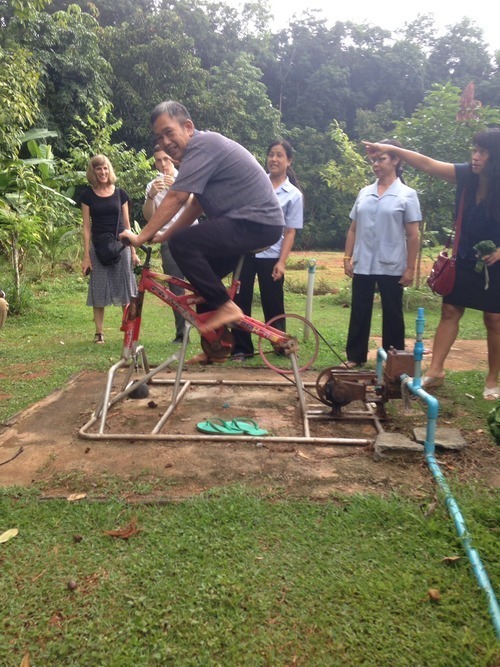 After winding down very tiny paths, not roads… And through multiple rubber tree farms we made it to the primary care unit that specializes in disaster response. We were the definition of middle of no where. We definitely were not expecting what was there waiting for us. 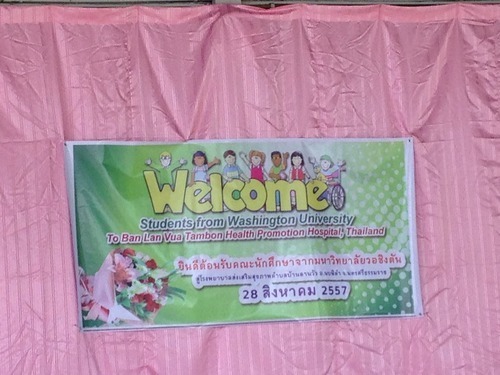 All the staff was dressed in pink uniforms, there was a stage and cabana set up welcoming us and a banner that said “welcome University of Washington students”. That was so cool! They we’re so excited that we were came because they said no one ever comes to them and they are never paid attention to so it was a big deal that we had made the trek out there. 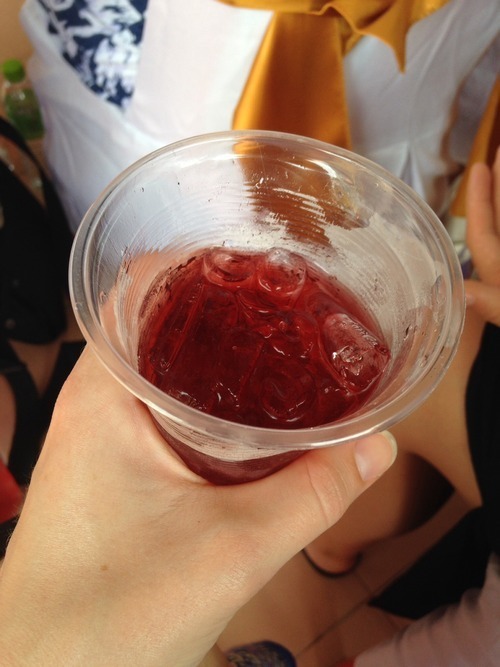 We were sat in the front and given the “honorary drink” which was a pink hibiscious tea. So yummy!!! 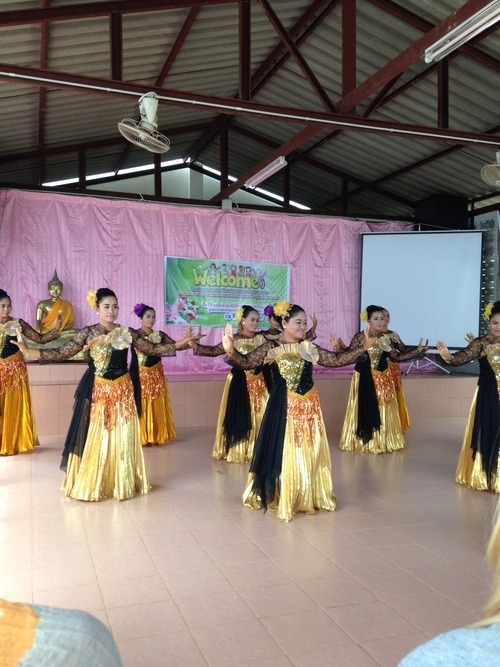 To begin the presentation some of the staff preformed a traditional Thai dance that was meant to welcome us and was very beautiful to watch. The presentation that followed was all about their plan for responding to the needs of the mentally ill if there were to be a disaster such as the tsunami that happen a while back. 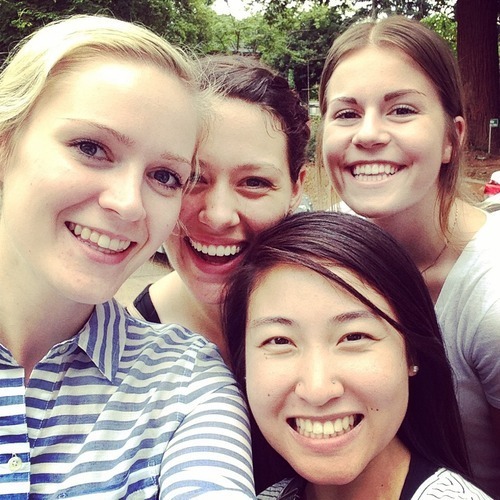 They detailed the entire process which when you hear everything in Thai takes forever… Every sentence or two the woman would stop so Jan, our teacher, could translate for us so it was like have a delay in the signal. Eventually we all understood there very well thought out plan and enjoyed what they had to say. What happen next was very unexpected. 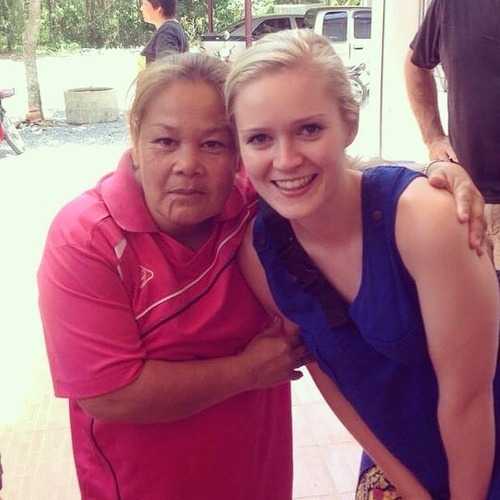 In Thailand, having dark skin signifies that you are a field worker and have very low economic status so naturally they strive to be as white as possible which signifies status since you would then be assumed to work inside all day. Needless to say I am the whitest person in the group and also blonde with blue eyes. AKA a “movie star” in their perspective since the only place these people see people like me is on the television. When the presentation was over and we broke for pictures I was immediately approached by most of the staff, about 50 women, and asked to take pictures with them. This was fun! They love my white skin which I get teased for at home so I was loving this. Little did I know they were persistent and a little aggressive. This lady especially loved me. 20 pictures later my face was starting to hurt and I was really in need of using the restroom. I tried to escape and since they speak no English at all they thought I was trying to run away. After 20 more pictures I needed a break so I made a run for the bathroom but my other classmates were already in it so that left me out in the open. Soon enough they came around the corner, shrieked, and dragged me back for more pictures. I guess the bathroom can wait? The weirdest part about it was that there are two other girls in the group that have blonde hair and are fair skinned as well. I kept trying to defer to them each time but the Thai women weren’t having it, but that might of had something to to with my wearing the tradition Thai clothing so I resembled something they were more familiar with. They would shake their head, point at me and then point at the camera as if to say smile I want another picture! I finally made it to the bathroom if you were wondering… But when I came out they were standing there and I just had to burst out laughing and run away. 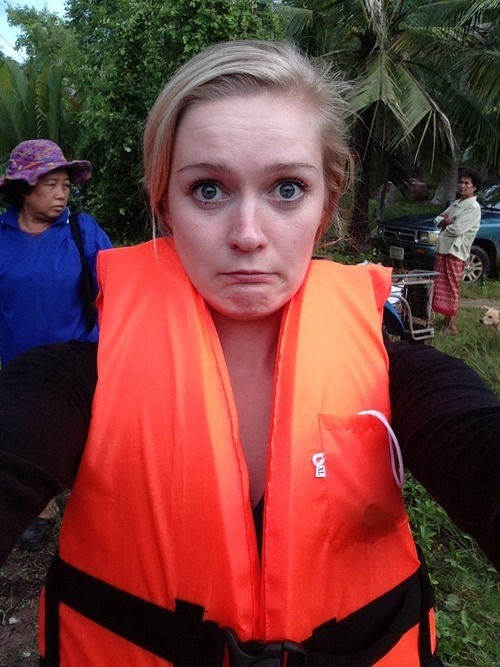 Who knew my whiteness would make me an instant celebrity in a rural village in the middle of Thailand. I made it upstairs to lunch where they thankfully weren’t eating in the same area but the joking from my classmates was hilarious. It was embarrassing for me to be in the spotlight to obviously like that but I decided to embrace it for that short time and then move on. 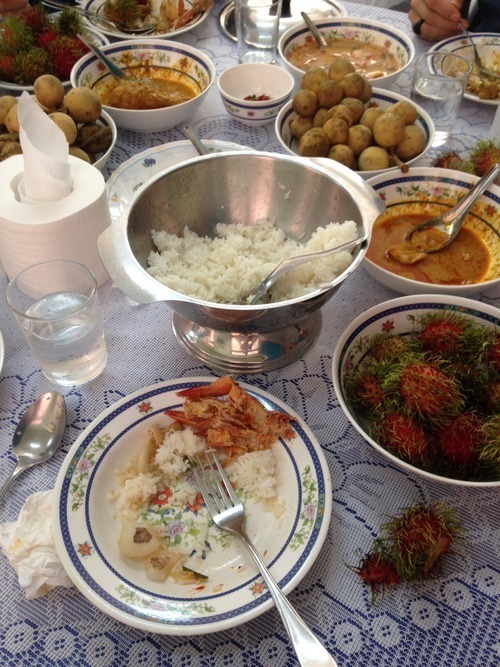 The lunch was delicious and we learned that the main woman’s mother had prepared it for us. 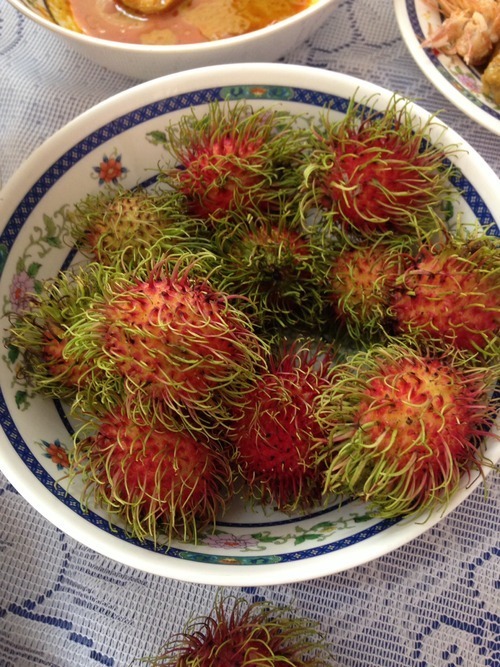 There is a sweet fruit inside of these hairy looking ones. We would get to meet her soon when we drove to the woman’s fruit orchards to see where the fruit that we ate at lunch actually came from. They were so good! I found a new favorite one called mangoseed. 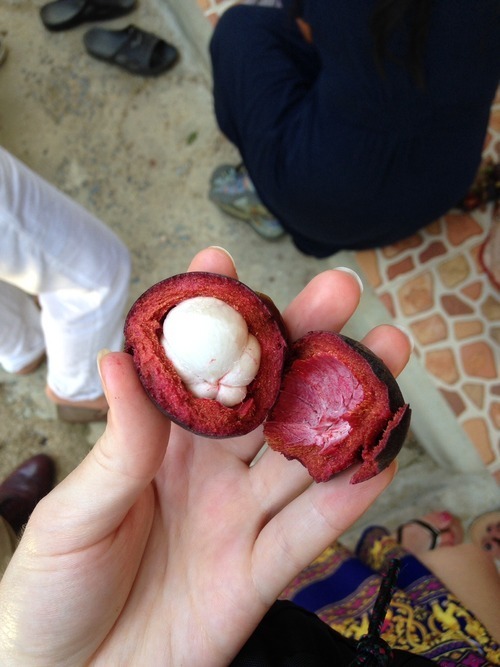 The inside is white and a texture that I have never had before but the flavor was crazy good. I even got to pluck my own off the trees with this really long stick like they harvest them in the field. Once we had filled our tummies with fruit, we headed to another primary care unit that was one step up from the previous one. This meant it was closer into town and functioned more like a hospital even though it only had 30 beds. We were welcomed here and given another presentation before we were ushered off to dinner at a location that wasn’t a restaurant but there was food set out for us… Very confusing but the food was good so we ate snails maybe? Haha something you sucked out of a shell and was really spicy. The best part of the night came next. We knew we were going on a canal tour because we are close to the water however we didn’t know what it was going to be like. Let’s just say we are lucky to have very adventurous people in the group. Again we drive down what seems to be someones driveway to the edge of a canal. It looks pretty, now where is the boat? One of my friends it’s like see those 3 long wooden things with the makeshift motor on the back? That’s our ride! Ok. So they hand us life jackets that have never been used before, still in the plastic wrapping. That’s nice they are letting us use life jackets that have never been worn before. The reason they have never been worn before you may ask? BECAUSE THEY HAVE NEVER DONE THIS BEFORE!! The lead guy excused the inconveniences by saying “I’m sorry for any hiccups, this is the first time we are taking people out on this tour.” Lovely. Well I strap that life jacket on till it becomes part of my skin and prepare to capsize at any moment. He starts the motor which sounds like a car that hasn’t been turned on in years going bump bump….. Bump bump…. Bump bump bump bump vroooooooooommmmmm!! Ok we are off and going. As we are slowly cruising through these canals it’s a mix between Florida, animal planet and a wild safari trek. We have some time were we are just cruising which allows me to put the pieces together. The point of this boat tour is to see the fireflies. Sweet! It’s getting a little dark..The driver is wearing a headlamp…. And his 7 year old son is tinkering with wires and a battery to hook up a giant flashlight.. Hmm? We are gonna be out here in the dark!? They have never done this before… We are off to a great start. I don’t have any other choice so I collect myself, look around at the beauty around and and prepare to enjoy the ride. If you can believe it I actually picked the best of these boats because once we got out into more open water the 3 boats split up. We were fine, cruising along, trying to speak with the Thai people and observing the nature around us. All of a sudden we shined our light on a boat that was stopped in the water and our driver starts yelling at them in Thai.. We have no idea what is going on but it doesn’t sound good. After much translation and listening very intently we are told that the boat holding our translators and van drivers has died and they didn’t bring the tools to fix it out here. So it is pitch dark, getting a little cold if you can believe that and they have no way to pull this boat or make the engine start again. I tell myself, just keep looking at he pretty nature… I can’t understand what they are saying and I can’t get up and help so my only option is to sit there and soak it all in. Eventually they flag another fisherman down who is going up the river to push this boat over to a dock where they might have the tools to fix it. Ok crisis avoided…. Almost. As we are waiting for that boat to get fixed the other boat holding the rest of my classmates and one of the translators pulls up next to us. We say hi and ask how it is going but we don’t even have to wait for a response because the translator is scooping water from the bottom of their boat and throwing it over the side. THEY ARE SINKING! So one boat’s motor died and the other one is sinking. This is going bad real fast however my boat is still afloat and running 🙂 thank goodness! With all of these events occurs we decide it is time to head back which is still a good 30 mins away. We all made it back safely despite all of the “hiccups” they warned us about. That’s one night we will never forget but a very fun one for sure! That is all for now. I just want to say that although my blogs are funny and a little dramatic I am actually having a fabulous time and learning a lot about nursing and myself. This is an incredible opportunity and I am glad to be sharing it with you all 🙂 tomorrow we are off to the beautiful island of Koh Samui, for a relaxing weekend off from the program to lay on the beach and possibly go snorkeling. We woke up early this morning to catch a flight to our new destination, Surat Thani, which is in the southern part of Thailand. The flight was only an hour so it barely felt like we were in the air and then we were here. The best part was that our plane was pink and was painted to look like a duck. We got picked up at the airport by 2 drivers and 3 hospital staff that are associated with this part of the program and have been set up to help us for he next couple of days. 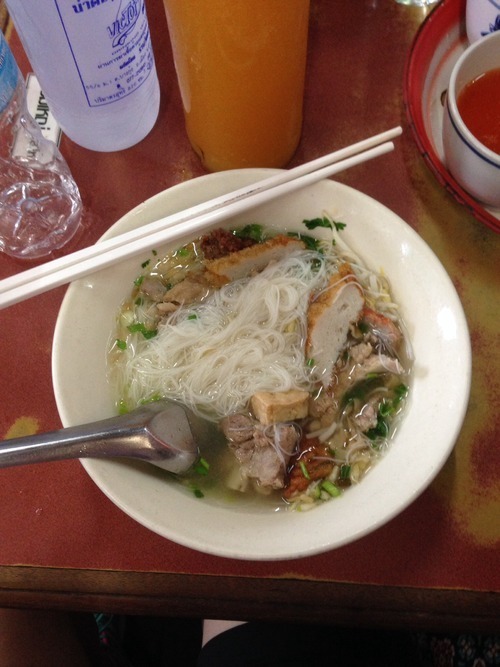 We stopped in town for some lunch as a famous restaurant and ate what looked like pho. We stuck to the “don’t ask, just eat it policy” and it turned out really good. This was also the first place I got to try a traditional Thai desert which was very different from the US. When we pulled up to the hospital it was very green, relaxing and rural looking. It looked nothing like a hospital. Our group was greeted by a couple of patients who had very graciously made flower bouquets out of leaves and presented them to us in very respectable ways. They told us that these “patients” had actually been discharged from the hospital but their family’s no longer wanted them and would rather pay for them to live in the hospital housing… How sad… We were then ushered into a meeting room where the staff, who surprisingly spoke enough English to give a presentation, told us a little about what they do there and how well their hospital functions. The next part was my favorite! We actually got to go see where they treat the patients and where they live depending on why they are there. The first one was to the house of the people who live there because their families refuse to take them back. These people were very nice, serving us iced tea and speaking what little English they know. As we are all standing in a group, mind you these people are starring at us the whole time like we are some martian creatures, one of the older guys comes up to us, stares me right in the face and screams “DO YOU BELIEVE IN GOD? !” I was so taken off guard that I was at a loss for words… I literally just starred at him then at my teacher with a “save me” expression. That was bizarre…. From there I avoided any other mishaps such as this one and the man got on a bike that pumps water when you peddle. Thank goodness he found a distraction. We continued to the house where people with substance abuse problems live. They of course starred at us too and wanted to take pictures with the tallest guy in our group because he looks so different. We left there without talking to many of them and continued on to what I thought was the most intense part of the site visit. In Thailand the majority of people who have a mental disorder suffer from schizophrenia. The initial treatment is medication and counseling however if that doesn’t work you are then prescribed electric shock therapy. This came as a shock to me because I thought this practice was eradicated with lobotomies a long time ago… Do they really still do his to people. We explored the room where they preform them and where they recover and hat was enough for me.., I would rather not think about an electric charge surging through someone’s brain inducing a seizure. They said this was a very effective technique but for me that did not make it sound any less scary or painful. We were happy to get out of there and move onto the children’s unit. Tonight our professor suggested that we go to a market down by the water to have dinner… This was a disaster. It poured rain and none of us had jackets because you don’t ever need them and it’s to hot to wear them otherwise. Long story short, we all got drenched like little wet rats and stumbled into dinner looking as though we had swam there. After a while of being in he rain I decided to just embrace it and feel the wetness because there was no other option and it wasn’t really that cold. I guess I can check running through the rain off my list along with not eating dinner because it was too spicy. Good thing I like plain white rice 🙂 Since I couldn’t eat that much at dinner, we decided to go get ice cream at 7/11 and got a very big surprise! 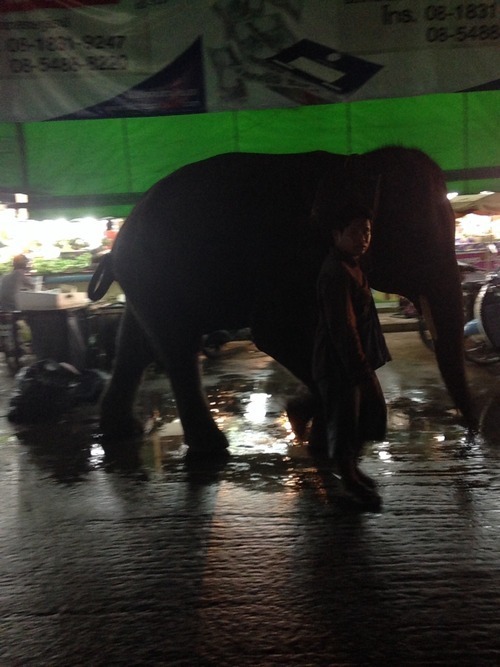 Just walking down the street on a leash was a giant elephant! This is the first one I have seen since we have been here and in such a random place. Today is the day! I have been waiting months for this day to finally be here and have worked very hard to make it happen. I must admit that my bags have been packed for quite some time and I have recently finished acquiring the last few necessities (i.e. maps, e-books and of course tons of snacks). I will be flying out tonight at 2:10AM and it will take me 12 hours to get to my first stop, Taipei, Taiwan. I’ve been told to spend the 4 hour layover exploring their beautiful and quirky airport so there won’t be a dull moment for me anytime soon. From there it will be another 3.5 hour plane ride to Bangkok, Thailand where I will begin navigating the taxi service in order to arrive at my quint little hotel. At that point I will probably fall over from exhaustion, but it will all be worth it! 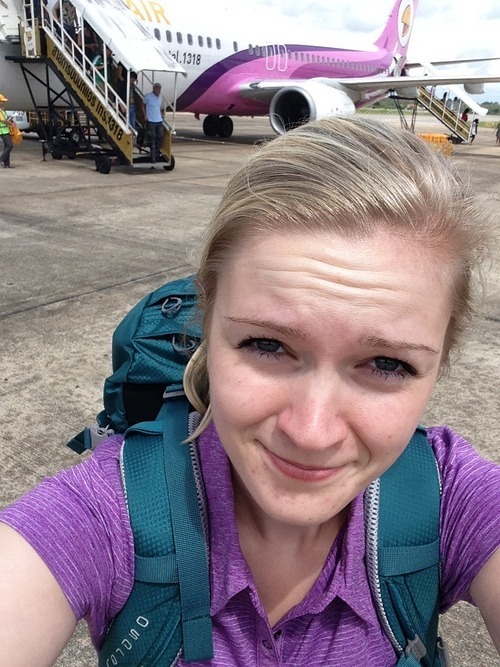 I am so ready for the adventure to begin and can’t wait to see everything Thailand has to offer!